One of my earliest food memories is the smell of a freshly baked traybake when I was in primary school. The smell was so sweet, so rich and I couldn’t wait for lunchtime when I could grab the biggest piece and ask the dinner lady to cover it in custard…she was so lovely and always gave me extra. Sweet memories such as this is why I love to share even more, I get to share a recipe that I love and part of my childhood, too. I can still remember the feel of the desiccated coconut on my fingers and all the jammy mouthfuls, life was good. 1 Preheat the oven to 180°C (350°F/Gas 4) and line a 20 x 30-cm tray bake tin with greaseproof paper. 2 Cream together the butter and coconut sugar in an electric mixer. Add the eggs and organic vanilla extract and beat or whisk well until very pale and fluffy, this step is crucial so spend time on this step! 3 Gently mix in all the dry ingredients with a wooden spoon and pour the mixture into the prepared tin and spread out with a palette knife. 4 Bake in the preheated oven for about 35–40 minutes or until golden and springy to the touch. 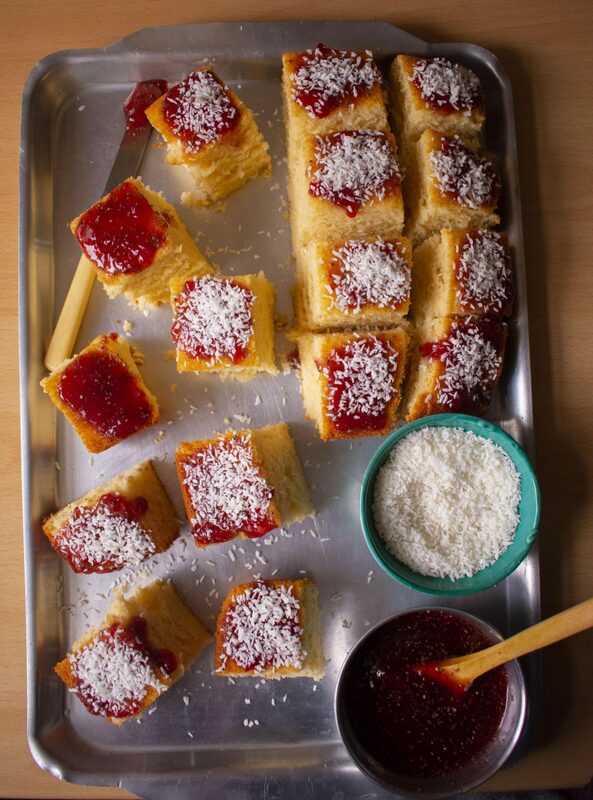 Remove the cake from the oven and leave in the tin to cool completely before spreading the strawberry chia jam over the top of the cooled cake then use a spoon to spread the desiccated coconut on top.